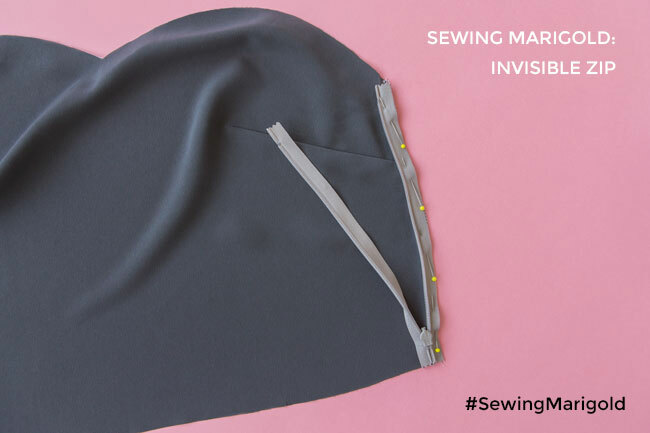 Whether you're making the Marigold jumpsuit or just wondering how to neatly insert an invisible zip into another garment, read on! An invisible zip (AKA "concealed zip") looks like this - you can't see the teeth from the right side. Once sewn into a garment, you shouldn't be able to see the tapes either - the fabric seam lines will join up to conceal everything but the zip pull. Ideally you'll also want a zip in the same colour as your fabric. But don't worry if you can't find one - remember it's only the zip pull that will be visible from the outside of your garment, and you can always paint this with nail polish! 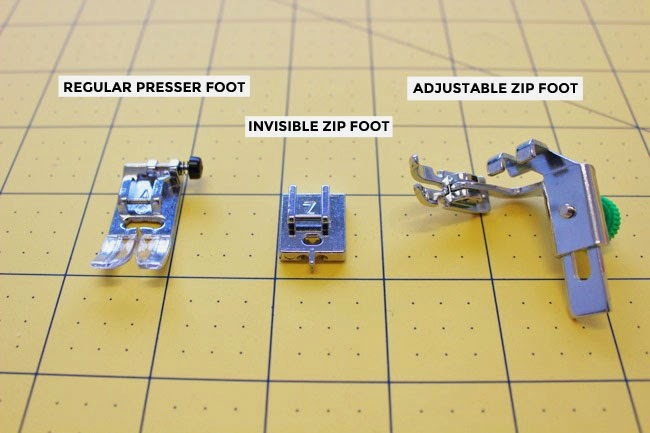 To install an invisible zip using the method I'm going to show you, you'll need an invisible zip foot for your sewing machine. If you can invest in a metal one, rather than a plastic one, you'll find it easier to get a neat result. The plastic ones are okay but they don't exert as much pressure as the metal ones. I found I got a much better result once I made the switch. To finish the seam under the zip, you can use a regular presser foot. However I highly recommend getting an adjustable zip foot - and of course check that whatever you get fits your model of sewing machine (this is an affiliate link). Adjustable zip feet (also used for sewing piping) have a narrow presser foot whose position you can move so you can sew reeeeeally close to zip teeth, piping etc. I can't remember how I managed without one! Okay, let's do this. 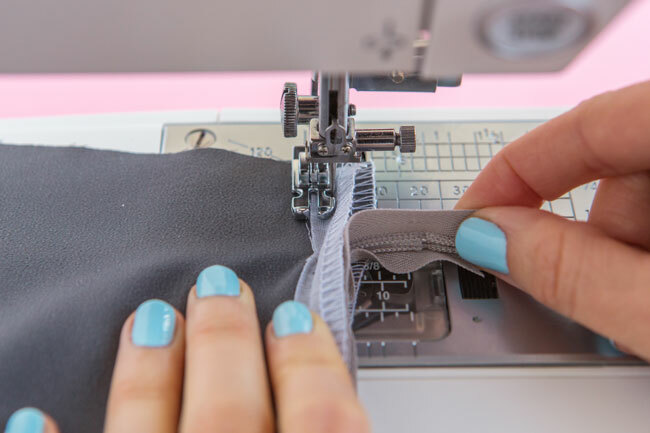 The first thing to do is to apply strips of interfacing to the wrong side of the opening - in the case of the Marigold jumpsuit, the opening is the unstitched bodice side seams. I'm using 20mm (3/4in) wide strips of interfacing so they slightly overlap the seam line 15mm (5/8in) in from the raw edge. 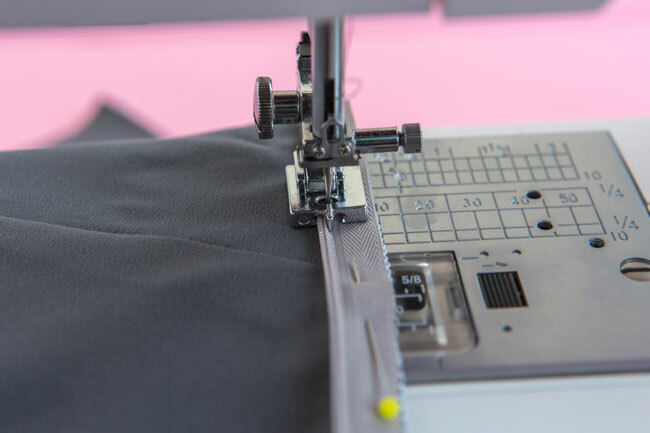 This is a good idea on lighter weight, drapey fabrics such as those used for the Marigold jumpsuit, to give extra support to the zip seam so it doesn't end up wibbly. For other projects using heavier weight fabrics, you might prefer to use narrow interfacing strips that don't cross the seam line. If you want the seam allowances to end up hidden under the zip tapes, trim them down by 5mm (1/4in) (assuming each zip tape is 10mm (3/8in) wide, which they usually are on invisible zips). Finish the raw edges using zigzag stitch or an overlocker (serger). Press the finished edges under, wrong sides together, by 10mm (3/8in) (or 15mm / 5/8in) if you didn't trim them down). The fold is where your zip opening will go. Open the zip. 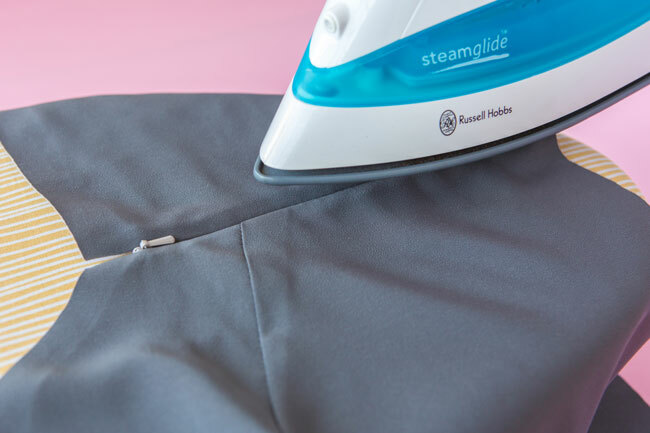 With the iron on a very low setting, with no steam, gently press the curled zip teeth out flat from the wrong side. Be very careful not to melt the teeth or your zip will get stuck! Pressing the zip teeth flat makes it easier to get the needle right up close to the zip teeth. The zip opening will go on the left side of the Marigold bodice as you're wearing it. With your bodice right side up and opened out flat, temporarily fold out the pressed seam allowances so they're also lying flat. Flip the zip over on top of the front bodice opening so the right sides are facing each other. Line up the long edge of the left zip tape (now on the right as it's face down) with the finished seam allowance on the front bodice. The zip teeth should be in line with the fold you pressed earlier. Position the top of the zip tape - the teeth side - so it's 2-3mm (1/8in) down from the raw edge of the bodice neckline. Leaving a little extra space at the top can create a neater-looking zip once it's done up. Pin it in place. Now you can take it to your sewing machine. Attach your invisible zip foot. Can you see there are two little grooves (or channels) on the foot? Slot the zip teeth into the left groove so the needle is over the zip tape. Start sewing from the top of the bodice, back tacking at the start. Stop sewing once the zip pull gets in the way, back tacking at the end. The invisible zip foot will allow you to sew really close to the zip teeth without stitching over them. Now you can pin the right zip tape to the back bodice the same way, checking the zip tapes aren't twisted. If you get confused about which way the zip should be pinned, I find it helps to imagine you're wearing the garment so you can figure out which way the zip tapes would sit on the inside. Stitch the right zip tape down, with the zip teeth in the right groove of the presser foot, back tacking at each end. Okay, so now we can sew the rest of the seam below the zip. Change your foot to a regular presser foot - or an adjustable zip foot if you have one. Pin the rest of the seam together - or you can just hold it in the case of the Marigold bodice as it's really short! There are a couple of different ways of sewing the seam below the zip. I always used to sew from about 2cm (3/4in) above the bottom of the zip to the bottom, back tacking at each end. Holding the zip teeth out the way, start as close as you can to the zip stitching without sewing over the teeth. If you're using an adjustable zip foot, line up the edge of the foot with the needle so it doesn't get in the way of the zip teeth. Last year I took a couture sewing course in which we were shown how to sew it the other way - from the bottom up towards and about 2cm (3/4in) past the bottom of the zip. I found this way allows you to get a smoother line at the base of the zip, and thus less of a bubble from the right side. 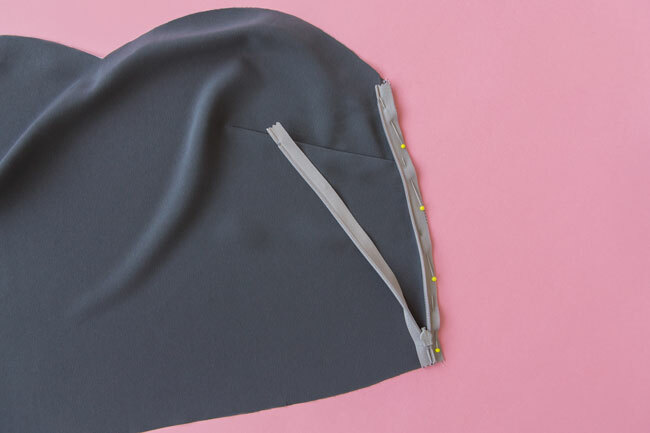 However you do need to make sure you start sewing at the seam allowance you want to end with. 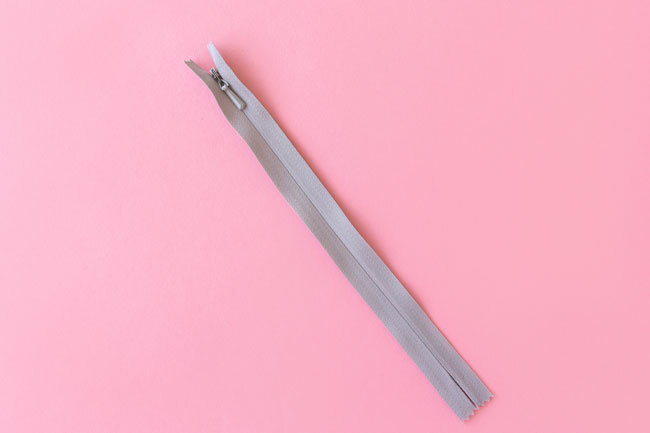 Once you've finished sewing, take care to trim off any loose threads so they don't jam the zip. 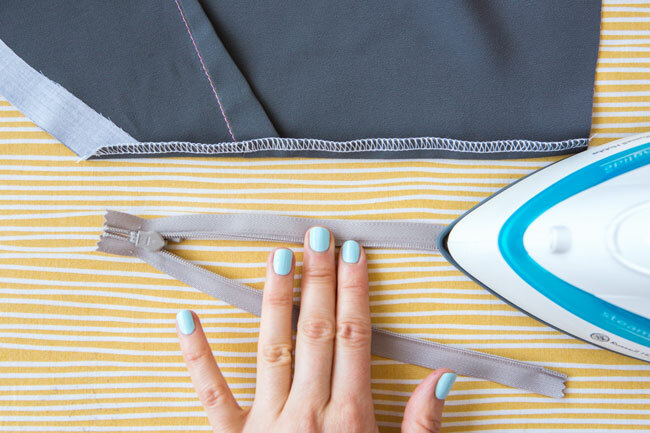 Do the zip up, then give it a steam with the iron from the right side. It's a good idea not to touch the iron plate to the fabric - you don't want to melt the teeth! Just hover and steam. And that's it! You've sewn an invisible zip! 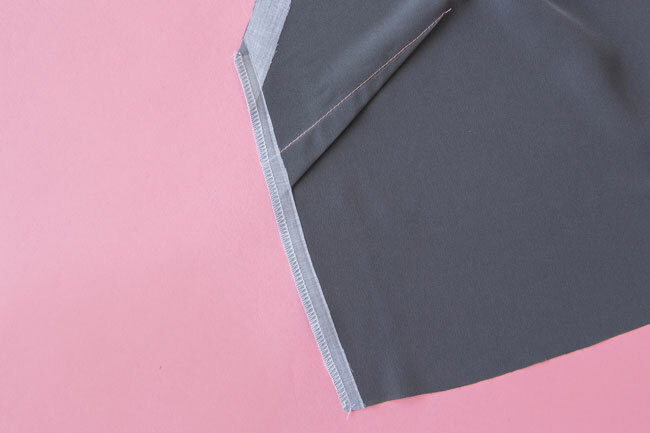 The aim of the game is for the zip tapes to be completely hidden from the outside of the garment - all you should see is a seam line where the front and back bodice join. If you're making the Marigold jumpsuit, in the next post we'll attach the straps and neckline facing. You can catch up on Marigold sewalong posts here.